One of the most interesting essays in Durham’s work on Revelation is entitled “Concerning a Calling to the Ministry, and clearness therein” (Revelation, 66-77). At the outset Durham highlights the importance of certainty regarding the calling to the ministry, “Ministers are but Ambassadors; and so for them to want [lack] clearness of the Lord’s Call, is to be uncertain whether they have a Commission or not…” (p66). The whole area of the call to the ministry is an important matter. It is wise at the outset to clarify what we mean by “call” for in the words of Durham “When we speak of a call… it’s not to be understood, that men now are to look for an immediate and extraordinary Call… [but] in a mediate way” (p67). A direct and personal (audible?) call from the Lord to leave our nets and become fishers of men is not for today. Durham also addresses the area of our own desire urging that “great stress would not be laid on a man’s own inclination or supposed impulse” (p68). He cites Moses, Jonah and Jeremiah as those who were truly called but had the opposite inclination! So, negatively, the call is not “extraordinary” and it is not an “inclination”. But positively what is involved in a call? Having the requisite gifts is “the great differencing Character of a Call”. Although gifts do not finally “constitute” a call yet if a man is called God will give him the gifts. (p68). It is the recognition of the gifts by the church “that maketh a Call”. (p68). There must ultimately be a yielding to the recognition of a call/gifts by the church. (p69). God’s providence may, where there is doubt over a calling, clear matters for us. If all other doors are shut to us which we might naturally have expected to be wide open, then it may be a sign to confirm a call to the ministry. (p69). It is not unusual for the Spirit to create a desire in someone for the ministry when that is to be their calling. (p70). But this working of the Spirit is “not alike in all or equally discernible” (p70). For some it is powerful and direct but for others it may progress in stages e.g. a loss of interest in (or love for) our present calling, a love created for reading and studying, the heart becomes restless in all other things but the ministry etc. (p70). There is a difference between a call to “the study of Divinity” and “the Ministry”. The former may be present without the latter. (p71). But we must be careful for “every impulse, which may be to the Calling of the Ministry, is not to be accounted an impulse of the Spirit of God” (p71). If we are constrained contrary to our natural inclinations, with a motive for God’s glory and the edification of his people, with a willingness to submit to the judgement of the Church, with a desire for study, and with the appropriate gifts (p71-2) then we may trust it is a true calling. An absence of this “impulse of the Spirit” does not mean there is no calling, for it may simply be that we do not discern one even though it is there, or it may be that the other elements of the calling (e.g. gifts) are sufficiently clear that this is not necessary (p72-3). Having defined a calling to the ministry Durham went on to challenge the way the “calling to the ministry” worked out in practice. This is where Durham’s essay gets interesting. Everything else he says is eminently helpful, but fairly standard. On the practical outworking of the calling to the ministry, however, he is quite radical. For Durham, the Church proactively calling men to study was preferable to the situation of his day, where the Church was “almost, confined in her choice to a number that give themselves, or at most are designed by their Parents, or possible constrained by necessity to follow such a study” (p73). For Durham the idea that a Church could call a man to train for the ministry without his prior indication of such a desire was eminently reasonable. He argued that the Church was one body and that every member of the body had a duty to use their gifts in a way “as may most conduce for the good of the whole body”. So if the Church deemed a member may most edify the body by being in the ministry there was no reason why the body might not “appoint him to the Ministry”. The person so called would have a duty to accept this appointment because he has a “duty” to the body “which is to be preferred to any particular member’s interest”. Durham argued this was the apostolic method. (p74). Durham summarised his approach as “There would be some choice made in the designing of Youths for that Study (the Ministry): so that in an orderly way, some might be trained, and not have liberty otherwise to withdraw… We would not have Elections bound and limited to that number, so as either any whosoever thus trained up, might certainly be supposed as capable of being Ministers, or as if no Congregation or Presbytery might fix their eye upon, or give a Call unto any other.” (p74-5). Durham argues that his position is that of the First Book of Discipline which he quotes “Moreover men in whom is supposed to be any Gift, which might edify the Church, if they were employed, must be charged by the Ministers and Elders to join themselves with the Session and company of interpreters, to the end that the Kirk may judge whether they be able to serve to God’s glory and the profit of the Kirk, in the vocation of Ministers or not.” (p75 – italics as original). If those with gifts were not willing to comply they were to be subject to discipline! Durham believed this approach “if it were zealously followed, might by God’s blessing prove both profitable, and honourable to the Church.” (p75). Perhaps that all seems a bit radical? Well the church in the UK has a shortage of Pastors, and people recognise the problem but relatively little changes. Why not be radical and proactive? Why not call men into training rather than waiting for them to (never) put themselves forward? For James Durham the Song of Solomon “treats of Christ and his church in their most glorious, lively, and lovely actions, to wit, his care of and love unto his church, and that in its most eminent degree; and also of her love unto him in its various measures and workings” (The Song of Solomon, Edinburgh, Banner of Truth, 1982, 63). But what led him to take this approach? Why did he not see it as a book about marriage and human love? Well, he patiently explains why in his Clavis Cantici or A key, Useful for Opening up the Song which form the introductory chapter to his commentary. There is much in there worth careful consideration. A knowledge of the whole scriptures, but especially the book of Psalms and other Songs in scripture. (p24). It is of vital importance “that one have some experimental knowledge of the way of God towards his own heart: he who is so wise as to observe these things, even he shall understand the loving kindness of the Lord”. Durham observes, “such kind of experience is one of the best commentaries upon this text”. (p24). To be in a “lively frame” toward God i.e. not to be backslidden. (p25). “Much conversing with the Bridegroom, especially by prayer…” (p25). How many academic commentaries place these qualifications foremost? The aim of Scripture is edification. Without a spiritual application, i.e. unless the book speaks of more than human love, that aim would not be met. (p28). The excessive nature of this love, if it were human, is unsuitable for Christian imitation. Where is love to Christ in all this? (p29). Other allegories in Scripture must be compared to the Song. Consider Ps 45, Matt 22, Jer 3, Hos 2:3, Ezek 16, Luke 14, 2 Cor 6:1, Rev 19:8). These refer to Christ and the church and so must the Song. (p33). There is scriptural warrant for allegories i.e. Matt 22:2 (p30). It cannot represent Solomon’s marriage because to which of Solomon’s historical marriages does this refer? (p32). The New Testament does not make Solomon’s marriage (which one?) a type of Christ and “it is hard to coin types without scripture authority” (p32). Solomon’s marriage to Pharaoh’s daughter was against divine law (p32). “When the literal proper meaning looketh absurd…” i.e. “pluck out thy right eye,” “eat Christ’s flesh”. (p44). When the literal meaning does not promote edification. (p44). When a literal sense makes Scripture false e.g. “destroy this temple and I will build it in three days.” (p45). When a literal sense contradicts other scriptures and the “analogy of faith” (p45). When a literal sense does not agree with the meaning or intention of the speaker e.g. John in Matt 3:10 “the axe is laid to the root of the tree”. (p45). So then the Song expresses: “the mutual love and spiritual union, and communion that is betwixt Christ and his church, and their mutual carriage towards one another, in several conditions and dispensations.” (p32-33). When speaking of the Church it can be understood as visible, invisible, catholic or an individual believer (p37-38). Because of these differences, “there is need of wariness in application, that the word may be rightly divided, and the divers cases of the church and particular believers would be rightly taken up…” (p39). Durham considers helpfully how to apply allegorical scriptures and how to be sure we have arrived at their true meaning. I want to skip over these to consider a few of the objections Durham notes to viewing the Song as speaking of the love between Christ and the Church. One objection is that “the raising of gospel doctrine, makes this Song look more like the gospel of the New Testament, than a song of the old” (p55). Durham’s response it twofold. First he asks “Is it the worse, that is looks like the gospel?” (p55). In essence he is asking, are you seriously saying it is a bad thing to see the Gospel in the Old Testament? Secondly, he highlights that believers’ spiritual experiences in the OT are the same as the NT for: “Their faith and communion with God stood… in the exercise of inward graces, faith, love &c. which are the same now as then. Was not Christ the same to them as to us? had then not the same spirit, covenant, &c.” (p55). Another objection is that some may “doubt, if Solomon knew or intended such doctrines as these” and they complain that to interpret the Song as between Christ and the Church make Solomon “speak beyond his mind and meaning” (p55). Durham replies by stating that our concern is to know the mind of the Spirit and not the mind of Solomon. Our understanding is not to be limited to Solomon’s. But his main reply is that “there is no ground [not] to think that Solomon knew much of the mind of the Spirit” (p56). Given that OT believers have the same experiences as we do there is no need to doubt that Solomon understood the experiential love between Christ and believers that the Song unfolds. Durham cites Athanasius, Origen (with qualification), Jerome Zanchius etc. in support of drawing the Gospel from the OT. We must understand who is speaking in each passage (Bridegroom/Christ, Bride/Church, Bridegrooms friends/ministers, Daughters of Zion/weak & ready to stumble, Mother/the universal visible church, &c.) (p61). We must ponder what the purpose of the Spirit in each passage is. (p61). We are to beware of getting too caught up in all the details. (p61). We are to understand the “Bride’s frame” (love/despair etc). (p61). We must apply the text correctly depending on who is speaking/being spoken of. (p61). It is a most excellent song, in respect of its comprehensiveness; here is an armory and store-house of Songs in this one, where there is something treasured up for every case, that may be edifying and comfortable, which will not be so found in any other Song; there being something here suiting for all sorts of believers, under all the variety of cases and dispensations, wherewith they are exercised; and also all the relations under which the church standeth: all which, should commend this Song unto us. (p63). 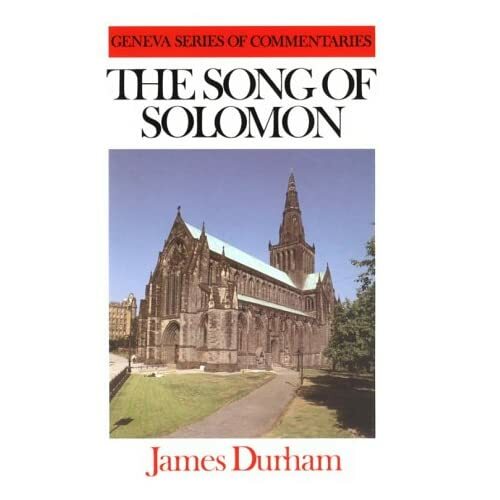 John MacLeod in his Some Favourite Books sums things up well, “Durham on The Song of Solomon has long been looked upon as the standard Scottish work on the subject. It is rich in its statements of experimental godliness…” (p30). Durham cites: Andrew Rivett p28. St Bernard p36. Weekly Update 36 – There is a Greenhill close at hand! Back to the esteemed Westminster Divine William Greenhill and his work Christ’s Last Disclosure of Himself. Joel Beeke and Randall Pederson in their work Meet the Puritans comment that, “These sermons offer some fine material on… the free offer of the gospel.” (Meet the Puritans, Grand Rapids: Reformation Heritage Book, 2007, p300). Indeed! Now last time, in my first post on Greenhill, I highlighted two evidences that Christ is willing to save sinners 1) His commands 2) His sweet invitations. This week I’m going to pick up on some more of his 15 evidences that Christ is willing to save sinners. Point 7 is particularly interesting and relates to the end and nature of the gospel ministry. Greenhill writes that Christ’s willingness to save sinners appears “in that the Lord Christ has instituted and appointed… His ministers, and sent them to woo, entreat, beseech, and draw men unto Him” (p137). For Greenhill, the very purpose of the ministry “is to make known His [The Lord’s] forwardness and readiness to receive sinners, and to go forth in His name, and to get them to come to Christ” (p137). Greenhill notes that “the great work of the ministry is to make known the willingness of Christ, and to bring sinners unto Christ so that they might have mercy from Him” (p139). How many today have this conception of the ministry? I have highlighted several times on this blog Durham’s conception of the purpose of the ministry and it is the same as Greenhill’s. Of importance to Greenhill is the fact that it is not merely the preacher who is beseeching sinners but “God beseeches sinners, and therefore we beseech you” (p139). This flows from the nature of the ministry – the minister is only an ambassador with no message of his own; his duty is to relay his master’s message. This also flows from the high view that the Reformed faith has of preaching. The Second Helvetic Confession says, “Wherefore when this Word of God is now preached in the church by preachers lawfully called, we believe that the very Word of God is proclaimed…” The faithful preacher speaks the words of God. Again Durham makes this point repeatedly. Point 10 highlights that it is “strong evidence that the Lord Christ is willing to save sinners and do them good in that He is grieved, troubled, and affected greatly that sinners will not come to Him” (p141). Citing Christ’s Lament over Jerusalem (Luke 19:41) Greenhill comments that “Christ is grieved to the heart that men and women do not come to him… Christ weeps over souls, families, and cities” (p142). Oh for the compassion of Christ! There is much of value in Greenhill’s other points but I’ll stop here. I would like to return to Greenhill at some point in the future on the idea of preparationism (the sinner has to prepare himself for coming to Christ by so much mourning over sin, thus placing the warrant to believe in the sinner’s own sorrow) as a cursory reading of him may give the idea he leans towards this.